I know this trip is going to be special as soon as I step into the airport and am greeted by a reindeer. Well, not a real reindeer, of course – though the taxidermy figure perched proudly at the baggage carousel is life-like enough to make me gasp. Flanked by a gaggle of tiny, behatted gnomes, cotton-batting snow billows under its hooves. A few plastic evergreens loom in the distance, completing the scene. No, I’m not in the North Pole, though an elf would blend in here. I’m in Finland, which you can fly to on Finnair, an Alaska Global Partner. Mileage Plan members can earn and redeem miles flying here from several U.S. destinations, including nonstop service from San Francisco to Helsinki. I take a deep breath and step out into the arrivals hall in Kuusamo. It feels like Christmas. I smile to myself as I hop a cab to my hotel. I shouldn’t have been so surprised at the festive welcome. Kuusamo, a ski resort town located in the northern part of the country, is a mere 120 miles from Rovaniemi, the hometown of Santa Claus. It’s also part of Finnish Lapland, the sparsely populated cultural and geographical region known for its sub-zero temperatures and idyllic landscapes. But I’m not here to go skiing or to visit Father Christmas. Instead, I’ve come to meet some reindeer. Real ones. The next morning, at Kujala Reindeer Farm, I finally get my chance. The day is chilly, a consequence of being only 40 miles from the Arctic Circle, and I’m cold. As I step out of my taxi, I regret not realizing I would need gloves in Northern Finland in August. I shiver as I extend my hand to Juha Kujala, the owner of the farm, who takes it in his and gives it a firm shake. Mention Finnish Lapland to someone in the know and they’re bound to tell you reindeer herding is both a cultural pastime and a business in these parts. The original herders were the Sami, an indigenous people of Arctic Europe who inhabit northern Norway, Sweden, and Finland. However, ethnic Finns soon adopted some of the Sami’s practices, which were rooted heavily in hunting, fishing, trading and reindeer farming. With an estimated 200,000 reindeer in the region, it makes sense that the creatures play such an important role; they’re used for milk, meat, fur, and transportation. Reindeer are a way of life in Finland. Juha, a fifth-generation reindeer herder, has had the farm in his family since 1860, and he’s been privy to the industry since his childhood. It seems there was never a question that he would eventually take over the farm; the profession of a reindeer herder typically goes from father to son, and traditionally, the whole family takes part in the work required to run it. Still, his passion for the furry creatures is evident. This is not just a job, but a calling. Juha leads me into a beautiful stone hut on the property, where I’m introduced to his partner Jenni. Over tea and a crackling fire, they tell me that since Jenni joined the farm in 2015, they’ve begun to incorporate reindeer tourism into their offerings. 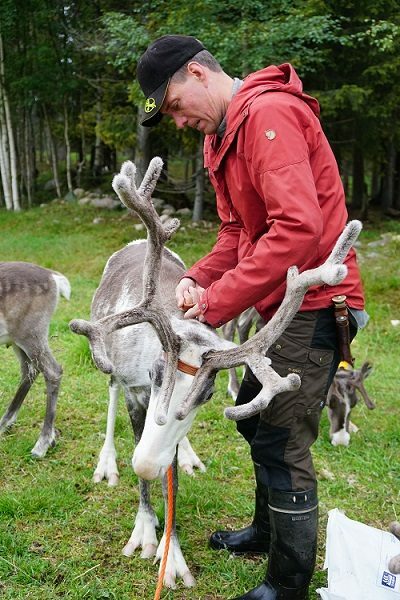 Tourists can participate in reindeer feedings, go reindeer spotting, or attempt to herd them under the watchful eye of Juha and his farmhands. And in the wintertime, visitors can even take a ride in a sleigh pulled by the adorable creatures. Juha explains that the daily routines of a herder differ depending on the season. In summer, though the reindeer are mostly allowed to roam free, there’s a lot of maintenance work to be done before the cold weather hits. This work involves mending fences, making hay for winter, and ensuring that the reindeers’ offspring are protected from predators like eagles, wolverines, and bears. Herders also spend a sleepless summer night rounding up, counting and earmarking the calves. When I ask how many reindeer reside at Kujala farm, my question is met with polite resistance. “Reindeer herders never tell the actual amount of reindeer they have,” Jenni tells me, and when I conduct further research in my hotel room, I learn that it’s actually a bit rude to inquire. Oops. And that’s part of the reason I’m here. I’ve been told that I’ll participate in feeding the reindeer, and I can’t wait. When Juha asks me if I’m ready to see them, I respond with an enthusiastic “yes.” A lover of furry mammals, I feel like I was born for this moment. I hope to sneak in some cuddles… or at least a reindeer selfie. We navigate a field with a steep downward slope, and I hobble ungracefully behind my hosts. Soon, we reach a large grassy clearing. It’s a peaceful, green landscape, edged by coniferous trees. It’s also devoid of living beings, with the exception of Juha, Jenni, and myself. “Where are all the reindeer?” I ask Juha, but he tells me that he’s about to call them. Suddenly he lets out a loud, short cry, followed by another. It takes about half a second, and then I see them in the distance: about 15 reindeer hurtling towards us at full speed. When they reach us, I realize that they vary slightly in size and in hue. They range in age from a few months to a few years old, and while most are brownish in color, a few have coats with large splashes of ivory. I soon discover that they also range in temperament – and my attempts to feed them hay are rebuffed. That is, until one calf envelops my fingers with her slimy lips. She allows me to pet her and I beam internally, feeling like I’m the chosen one. After stroking her coat, I push my luck, reaching up to touch her antlers. I am thrilled when she doesn’t run away. I run my fingers along the length of the antlers, surprised to find they’re covered in fur and soft, even a bit pliable. When I report my findings to Juha and Jenni, I’m told that this is because her antlers are new. 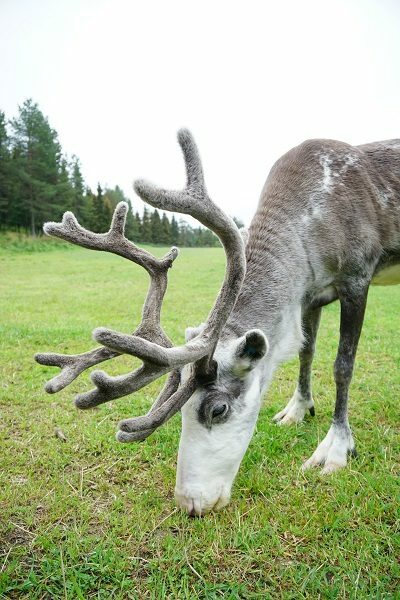 Reindeer drop and regrow their “antennae” every year, making this lady’s current set only a few months old. I look at them dumbfounded. I had no idea. After the reindeer are fed (and I manage to sneak in a reindeer selfie), it’s time to depart. In an email weeks later, Jenni and Juha emphasize that though running the farm is hard work, it’s totally worth it. “We love our reindeer… respecting the nature, and taking the best care of our flock,” they write, noting that it’s rewarding to see the results of their efforts. 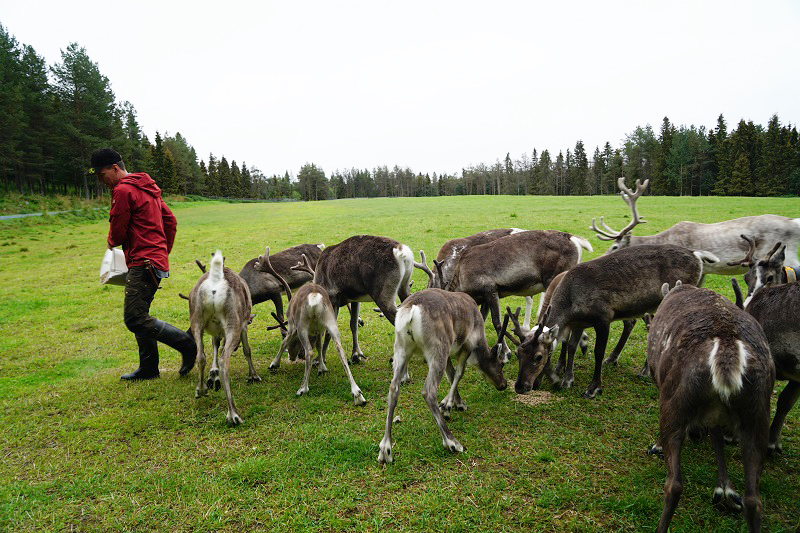 2 comments on "Festive in Finland: One woman’s quest to meet reindeer"
What an inspiring blog? Indeed, Finland is extremely beautiful country with it’s rich and vibrant culture and history.